LUCENA CITY, Quezon - The Department of Science and Technology (DOST)-Calabarzon has launched its Data Analytics-Ready Info Unified System or DARIUS project in a bid to integrate and harmonize data filing, gathering, monitoring and sharing practices in the regional Science and Technology (S&T) ecosystem. 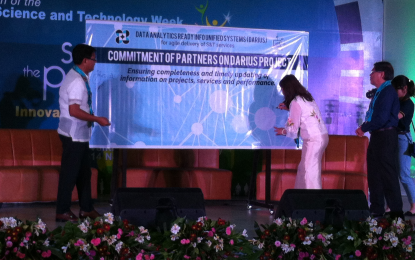 DOST Secretary Fortunato dela Peña, with Calabarzon Regional Director Dr. Alexander Madrigal, spearheaded the launching of Project DARIUS during the opening ceremony of the DOST Calabarzon Regional Science and Technology Week (RSTW) celebration at the Quezon Convention Center here on Monday. Dela Peña said that through the DARIUS project, DOST executives could access the online system via a dashboard to monitor projects status that now includes component for evaluation and a performance scorecard. “Dahil sa dami ng mga projects na mino-monitor ng mga DOST offices, paano ba namin ito mai-integrate into a regional at provincial level muna. Maraming projects and DOST, merong SETUP, grants-in-aid, rollouts, scholarships, ang hirap magbulatlat ng mga records,” Madrigal said during a press conference at the Southern Luzon State University (SLSU)-Lucena City campus conference hall. He said that DOST Calabarzon has its level of expertise in the field of Information Technology (IT), thus prompting them to develop the system’s analytics and design with the impression of the data base platform they initially used. The DOST regional director explained that they also started to cull provincial reports on the status of projects, templates on project profiles, financial reports, which led to the integration of the reports into their system data base. “It could be accessed online anywhere in the country on the data base with inputs from then Undersecretary for Regional Operations Carol Yorobe, now as S&T services on the inclusion of project evaluation and balance scorecard,” Madrigal said. He said DOST Secretary and Undersecretaries could also view the timely and accurate status of the projects through the DARIUS executive dashboard, especially on the levels of performance and technical reports among DOST regional offices across the country. DARIUS utilizes available information, processes, documentations that were otherwise voluminous and often complex in the regional DOST setting as technology continuously evolve and integrate these into a systematic, user-friendly app for integrating, informing, disseminating and processing data. This common platform could now fast-track data collection, processing and distribution to increase organizational productivity, hasten the implementation of strategic plans, programs, projects, services and the corresponding interventions.